There’s only ever been one court that’s had doing what’s fair as part of its official mission: the chancery court. With different names in different states (and countries), it was often the go-to court for cases of divorces, guardianship, real property partition and more. Exactly the kinds of cases that tended to produce information we can really use as genealogists. Sound like sometime you’d like to know more about? Well, then, tomorrow is your lucky day. 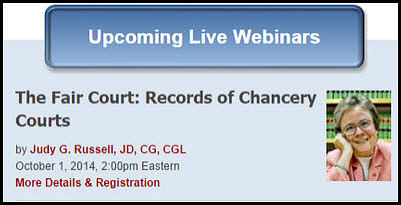 Because tomorrow, Wednesday, October 1st, is when The Legal Genealogist presents The Fair Court: Records of Chancery Courts, a free webinar sponsored by Legacy Family Tree. We’ll talk about the differences between the two basic types of courts — law and equity — and what kinds of cases were considered equity cases and so ended up in chancery courts. We’ll talk about the reasons why so much genealogical information tended to be included in the records of these kinds of cases. And we’ll talk about what kinds of records these cases created and some of the places where they can be found. But if you can’t clear your calendar for that block of time, remember that Legacy Family Tree webinars are available, free, for seven days after each webinar, and then available for purchase (individually or as a subscription package) so you can review the information more slowly, in more depth, at your own pace. I’m signed up & looking forward to it! Also, I just saw that you’re coming to the Houston Genealogical Forum in March so hope to see you then!